LiveIt! is a software solution for SD/HD News Playout in live and talk show environments. It is based on SHINE Media Platform and has been devised to aid operators in quick on-airing video materials as soon as they are available. Thanks to the wide range of SD/HD video file format supported, including Panasonic P2 and XDCAMHD MXF, it is able to play video content directly from camcorder media (P2 card, Sony Professional Disc, SD card and so on). LiveIt! provides an intuitive user interface displaying On-Air preview and playlist side-by-side. Preview shows the operator exactly what he is currently playing On-Air scaled in a window. Playlist contains the video materials organized by the operator and accepts clips in every supported format, even mixed SD/HD and with different codecs. No need to care about clip format: LiveIt! 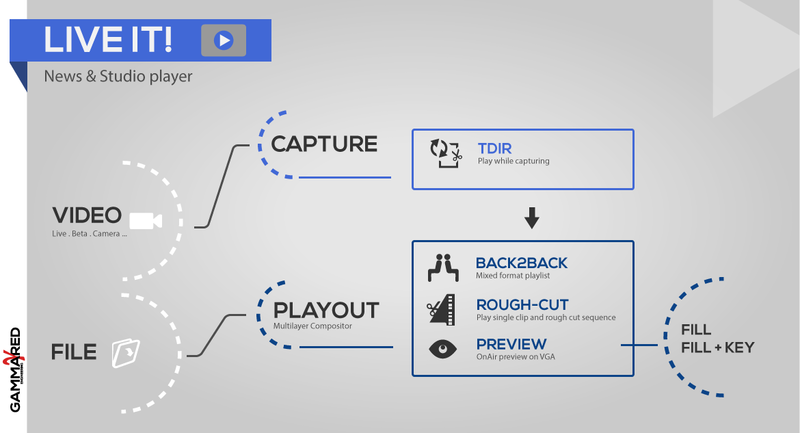 plays clips back to back and apply up/down scaling simultaneously if necessary, conforming playlist to the video format set for the output. Operator can play single clip as well as a rough-cut sequence. On cue command LiveIt! loads first frame in still and waits for operator command before start playing, in the same way, when clip ends, last frame remains still until operator stop command, avoiding any blank frame on-air. LiveIt! is not playout only: capture option enables operator to acquire video material from live input independently from on-air activity. Taking advantage of Time-Delay Instant-Replay feature, capturing clip can be added to playlist, trimmed and played at any time, even if it is still recording. Extensive native codec support in HD and SD including DVCAM, DVCPRO 25/50, MPEG2-IFrame422 (SD/HD), MPEG2-IBP420/422 (SD/HD), D10-IMX, HDV, DVCPROHD, XDCAMHD420/422, Avid DNxHD, H264 (SD/HD), P2.